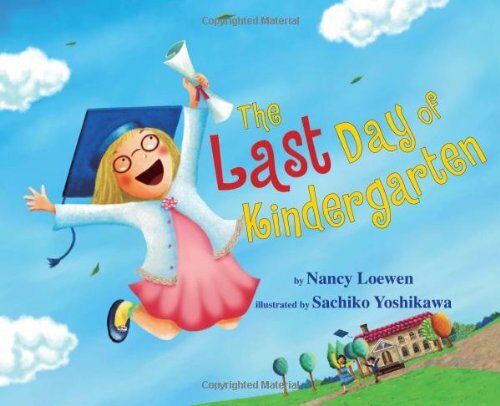 This is a delightful book for kindergarteners who are just a little apprehensive about starting Grade One. I remember my daughter telling me that Grade One was hard and not as fun as Kindergarten. I think this book would have eased her transition. The story, told in first person point-of-view, follows a little girl who is sad that it's the last day of kindergarten and she wishes it was the first. She reminisces about all that she's done. The teacher then helps the class to look forward to summer and Grade One. There is even a graduation ceremony at the end. My kids both made their own graduation hats, but their small ceremonies was not held on a stage with an audience of parents as described in the book. Nonetheless, it brought back memories for my kids and me. I just loved the bright, colourful and detailed illustrations in this book. As I was reading it to my son, I would ask him to find in the pictures objects that I named, and he would scour the pages in search of them. He is ending Grade One, though, and thought this book too “young” for him. Unlike my daughter, he had no problem transitioning from Kindergarten. If you have a child who is approaching his last day of kindergarten, this book will resonate and help him understand the transition from school to summer and back again. A cute book, to be sure. Disclosure: Thanks to the publisher and ReviewTheBook.com for sending me this book for review. I was not compensated in any other way, nor told how to rate or review this product. Thanks for the giveaway. I like reading retelling of classic lit. Booking Son is finishing up with kindergarten next week. I need to find this one at the library!